This the last of this series, and is linked to the preceding ones. I’ve given an original song to listen to while reading. I wrote it over a period of roughly two years about Wounded Knee. A score could be sent for educational purposes. Feel free to download it and put it to good use. 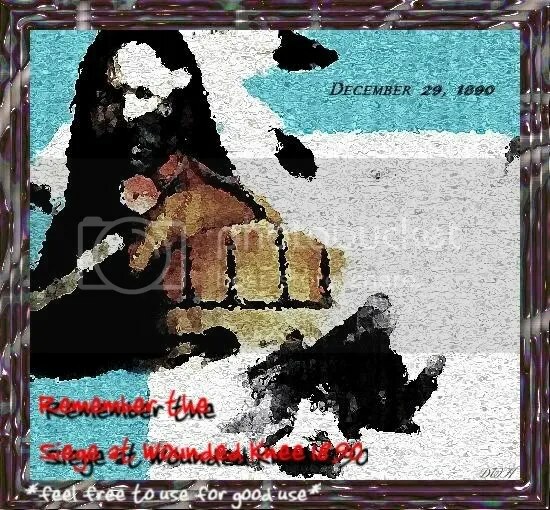 Topics covered in this four part series have been: prior events and circumstances that led up to the Wounded Knee Massacre, Wovoka and the influence of Jesus Christ’s teachings in Wovoka’s instructions to the Ghost Dancers, the innocent role of the Ghost Dance and Ghost Dancers in the Massacre, The Dawes Act and similar governmental policies, the Wounded Knee Massacre itself, some philosophical thoughts, and now the conclusions. While I must speak of two religions by necessity due to the nature of the historical context, I am endorsing neither. Loss of culture, loss of the buffalo, insufficient time to adjust to farming as a Nation, government subjugation, military subjugation, and Wovoka as their messiah who started the Ghost Dance are all part of the Wounded Knee Massacre of 1890.
who chose select scripture and terminology to consolidate their power. That powerwas used to subjugate,torture, and murder “heretics” during the Inquisition.Also, it led to the Holy Wars and the extermination surrounding the Black Death. Renewed religious fervour and fanaticism bloomed in the wake of Black Death. This spelled trouble for minority populations of all sorts, as Christians targeted “various groups such as Jews, friars, foreigners, beggars, pilgrims and Muslims”, and lepers, thinking that they were somehow to blame for the crisis. Lepers, and other individuals with skin diseases such as acne or psoriasis, were singled out and exterminated throughout Europe. Anyone with leprosy was believed to show an outward sign of a defect of the soul. What a testament to the death and destruction which comes when religion and politics join forces. The Black Death was approximately one millennium after the Council of Nicaea, and that propaganda is still used today. “…The phrase “Son of God” was used in place of to avoid any confusion on that point. The words “only-begotten” were further explained as meaning that the Word was not created from nothing, but possessed the very nature and substance of the Father. It was, however, by describing the Son of God as “of one and the same substance” with the Father-consubstantial-that the Arians were overcome above all. Those who insisted on this word realized this as much as did the Arians themselves. To say that the was “of one and the same substance” with the Father meant that he was not simply “from God” or ‘like God”; it meant that he God in the full sense of the term, identical with the Father. It was thus the ideal means for separating the orthodox believers from the heretics, for to accept this term meant to abandon the teaching of Arius. In this way did become the byword of Nicea and the years that lay ahead. When these formulations were finally settled, all but two of the bishops signed; they were condemned by the Council along with Arius. Even Eusebius of Nicomedia signed. The first General Council came to an end, and before the papal legates and the bishops returned to their homes, the Emperor entertained them at a lavish banquet. Joseph Campbell stated in an interview with Bill Moyers something to the effect of, “Yes, the words of Jesus are mostly intact.” However, his reference to other biblical content being mostly intact was negative. For those not familiar with his work, Joseph Campbell spent his life synthesizing the mythologies of religions and cultures worldwide. He shared his elixirs in the interviews he gave. One was discovering common ideas between cultures that never could have communicated. I honestly wonder how Constantine, Council of Nicaea, and the Ecumenical Patriarchs of Constantinople justified and rationalized these following words away. Woe to you,—You travel over land and sea to win a single convert, and when one becomes one, you make him twice the son of hell as you are. But then again, “their flock” was illiterate and only “select” scripture was read to them. One could communicate to God only through the priest, they were told. Not until the invention of the printing press in 1440, would people choosing that faith have the opportunity to read the scriptures for themselves. Sadly, the opportunity to do so is still not taken. The controversy and chaos surrounding the DaVinci Coderevealed how some congregations still do not know their own church history. I read where a local pastor said words to that effect; despondently, that congregation’s members were not taking advantage of the classes that were already being offered. I used to go to church services alone in the genre of what is being labeled “Progressive” or “Red Letter” Christianity. They were quite aware of their church history in my experience. Also, I had the opportunity to ask a Baptist youth minister once if he knew what a Reconstructionist was. Not only did he, but I got the impression that he thought Reconstructionism (replacing the Bill of Rights with Old Testament law) is negative. Indeed, blanket statements serve nobody. As a result of all that’s been stated, I can answer my first question. Was Christ was defeated by the Crucifixion and the propaganda crusade ? His words have survived, in spite of attempts for two millennia by brutal men to the contrary. He wasn’t defeated. Even though it still isn’t 100% implemented in its true intention across the country, it is a victory for the Ghost Dancers, and every Native American from the past who had to hide their beliefs and/or die for them. A highly respected elder who didn’t even know his own age and died last year spoke about it positively before his passing. His word was good enough for me. Thirdly, I heard an elder say that he finally felt that the culture of the Lakota is coming back stronger, that he doesn’t worry about it like he used to. Also, people actively go to the Oklahoma Historical Society to learn about their heritage; at the same time, science has provided a DNA test to at least verify general Native American ancestry (none of this is meant to ignore problems still existing in Native American life). Furthermore, none of that would have even been remotely considered in 1890, even if the means and technology were in place to do so, because Native Americans were not granted equal rights in the 14th Amendment of the U.S. Constitution in 1868. Before the final conclusion, it’s important to remember two more events. Leonard Crow Dog who brought back the Ghost Dance at the 1973 Siege of Wounded Knee, and the Big Foot Memorial Ride. This entry was posted on Saturday, October 6th, 2007 at 7:49 am and is filed under Uncategorized. You can follow any responses to this entry through the RSS 2.0 feed. Responses are currently closed, but you can trackback from your own site.